I just returned from Israel 5 days ago. I dealt with some things there and upon my return home to family issues that reminded me of how important the following is. How many of us have been wronged by someone else? 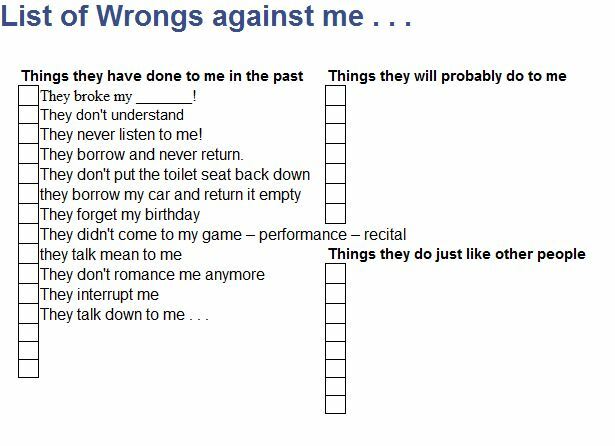 How many of us have been wronged by that “someone else” multiple times? They borrow and never return. They talk down to me . . . The list is endless. The more angry we get, the longer the list becomes. The more hurt we get, the longer the list becomes. The list justifies our hurt. The list justifies our anger. Or does it? In the text, we find that love keeps no record of wrongs. It keeps no “lists” of wrong doing. Reckon, calculate, take inventory, count, consider. Thoralf Gilbrant, ed., “3023. λογίζομαι,” in The Complete Biblical Library Greek-English Dictionary – Lambda-Omicron, (Springfield, MO: Complete Biblical Library, 1991), WORDsearch CROSS e-book, Under: “3023. Î»Î¿Î³á½·Î¶Î¿Î¼Î±Î¹”. Bad, evil, wicked, worthless, depraved. Thoralf Gilbrant, ed., “2527. κακός,” in The Complete Biblical Library Greek-English Dictionary – Zeta-Kappa, (Springfield, MO: Complete Biblical Library, 1991), WORDsearch CROSS e-book, Under: “2527. ÎºÎ±Îºá½¹Ï‚”. Thoralf Gilbrant, ed., “7930,” in The Complete Biblical Library Hebrew-English Dictionary – Sin-Taw, (Springfield, IL: World Library Press, Inc., 1998), WORDsearch CROSS e-book, Under: “7930”. Satan. Accuse. They are synonymous. When we keep a list of wrongs against another, we are not righteous. When we keep a list of wrongs against another, we are not sanctified. A record of wrongs – a list is a preferred tool of Satan. There is no love in a list. When we keep a list, when we make accusations against another, who are we emulating? Make no mistake brothers and sisters, Satan is a deceiver. Satan is an accuser. He is VERY real. question. In Judaism “sh’eilah” can be a technical term meaning a question about halakhah (Jewish law) or some other aspect of the Bible or Jewish tradition. Mt 22:23+. David Stern, trans., Complete Jewish Bible, (Clarksville, MD: Jewish New Testament Publications, 1998), WORDsearch CROSS e-book, Under: “S”. Thoralf Gilbrant, ed., “25. ἀγαπάω,” in The Complete Biblical Library Greek-English Dictionary – Alpha-Gamma, (Springfield, MO: Complete Biblical Library, 1991), WORDsearch CROSS e-book, Under: “25. á¼€Î³Î±Ï€á½±Ï‰”. This is significant! The same Greek word for love that tells us LOVE can’t exist when you keeping a list is the same Greek word for love that Yeshua uses to describe the two commandments that the entire Torah and Prophets are dependent on!!! In other words, the love you are to have for God and for you neighbor is the SAME love that keeps no track of wrongs! When you keep “lists” of someone’s wrongdoings against you, you don’t have this love. How can you love God when you keep track of another persons wrongs against you? How can you love your neighbor as yourself?!? When you take the roll of accuser, it is in contradistinction to God’s command to love because there is no love in accusation. As I have said many times, it always comes back to the heart! Where is your heart when you accuse? Where is your heart when you have a “list?” This is a daily repentance issue for me. It is not easy. I fall prey to it more times than I care to admit, but I admit it to you freely in hope that you will see for the trap that is truly is – what a devastation it truly is to our walks. Were they sad that they were going to have to stone her? Did they have anguish? Was it tough for them? Was there mercy? Or was it blood-lust? It always comes back to a heart issue! This is what Yeshua taught all of them that day. They were convicted or they would have stoned her anyway and been justified by the law. When we keep a list, where is our heart? Where is our love for our neighbor? Where is our anguish and our mercy? This entry was posted in Living life Even if . . . and tagged accuser, christianity, even if, list, love, satan, wrongdoing, wrongs, Yeshua. Bookmark the permalink. 6 Responses to Love can’t exist when you’re keeping a list . . . Thanks for the likes and may Adonai Bless you! Always good to be reminded! Just a question…..the story in John 8……she was caught in the act……what happened to the man she was with? Would he have been under the same “law”? Was he also guilty of adultery? Would he also have been stoned? I know these questions are separate from the point you were aiming at but I’ve always wondered about “the man”. In trying to trap him, did they trap themselves? Did they expose their own hearts? 17 learn to do good! Seek justice, relieve the oppressed, defend orphans, plead for the widow. Was this justice without the man present too – or was it just to trap Yeshua? LOVE is our litmus test because all of the Prophets and Torah depend on two commands regarding love . . . Thanks for the encouragement Esther! Blessings to you!